British artist's first permanent sculpture tears up office brickwork. 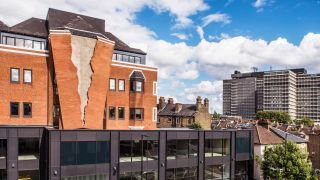 This week saw British artist Alex Chinneck complete his first permanent piece of art on the side of a new London office development. Titled 'Six pins and half a dozen needles', the monumental installation is made of 4,000 10-tonne bricks that look as though they're being ripped apart. Positioned on an office in Hammersmith, London, 'Six pins and half a dozen needles' has been designed to fit into the building's existing brickwork. It's the latest in Chinneck's body of surreal work, with previous pieces including an upside-down pylon, brick work that appears to curve into the ground like a piece of paper, and a disused building with identical smashed windows. In a statement, Chinneck explained that the work was conceived to engage people in a fun and uplifting way. ”Although we use real brick, it was designed with a cartoon-like quality to give the sculpture an endearing artifice and playful personality,” he said. The rip that tears through the building was designed to look like a page being ripped from a book. To get the right look, Chinneck spent months scanning in torn sheets of paper to create the design digitally. Over the next 14 months, Chinneck worked with engineers, steelworkers and brick-makers to turn the concept into a 12-metre high reality. Explore 'Six pins and half a dozen needles' by clicking left to right in the gallery below, or see it for real by visiting 77 Fulham Palace Road, London.